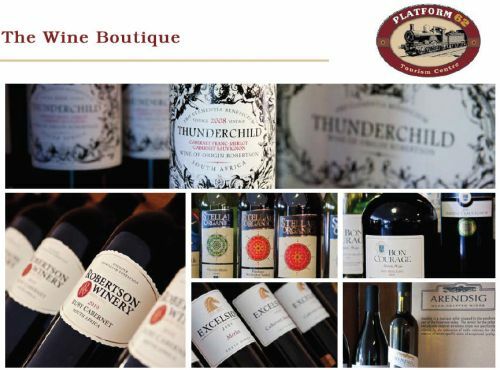 With over 500 wines on offer, PLATFORM 62 Tourism Centre Wine Boutique offers a unique wine experience to all visitors who would like to learn more about wine. Do not hesitate to ask your questions to the experienced staff. Wine can be tasted and enjoyed at the Wine Boutique's tasting counter. Wine tasting is done 7 days per week between 10 am and 5 pm. Specialist wine tasting and food pairing can be done for groups. (By appointment only) Wine can also be ordered online and delivered to your doorstep ANYWHERE in South Africa. The Shed Coffee Shop at PLATFORM 62 Tourism Centre is focused on both tourists and local residents. Light meals and stunning coffee served by friendly staff makes this a worthwhile stop. The specialty for a light meal is the Chicken Basket or Chicken Salad, while hamburgers and quiche is also a definite favourite! FAIRTRADE coffee, known as Puro Coffee, is a pure excellent blend that is environmentally friendly and helps in protecting the rain forests. Enjoy a cup of coffee with a piece of cake outdoors under the trees or umbrellas, or relax indoors among beautiful art. We are open 7 days a week Mon-Fri 8am tot 5pm sat & sun 08:30 tot 15h00. 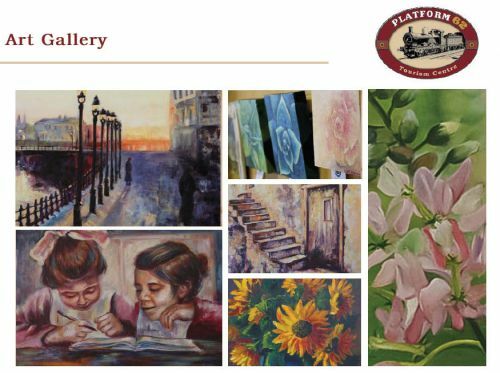 Large variety of art, including paintings and sculptures from our local artists. Visitors can browse and buy a variety of local products, from dried fruit - which, aside from wine, our valley is famous for! - delicious preserves and a variety of foodstuffs, interesting local crafts to fine art on exhibit in the Gallery. We stock various items for your garden and home. Platform 62 Tourism Centre is situated at the centre of the longest wine route in the world. Here visitors can obtain information about all the surrounding towns and attractions in the Langeberg Valley. Beautiful Wine Estates and farmlands surround Ashton. There are many well known horse breeding farms in the Robertson and Ashton area. 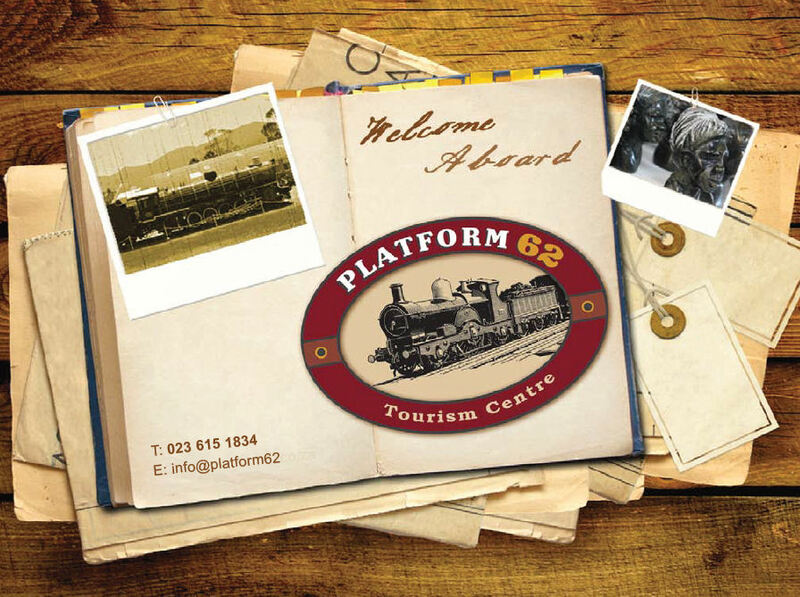 Platform 62 Information offers information, booking services and assists with tours and packages to the wine farms, tractor and boat trips. 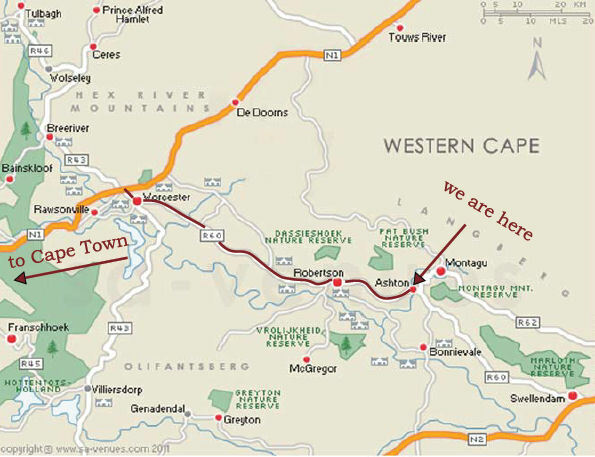 The area offers River Cruises, Tractor trips and short wine tours. Enjoy the wines of this popular Valley on the River Banks where light lunches are served.